The Perky-Pet Squirrel-Be-Gone Wild Bird Feeder III features 9 feeding ports, U-shaped perches, 3 separate seed tubes that allow for a variety of seed types and holds 8 lb of seed. The interior seed tower is surrounded by rustic metalwork. The feeding ports have sturdy metal perches that allow birds to feed comfortably-but, when the squirrels perch on them, their weight causes the entire metal casing to slip down, completely blocking the feeding ports and their access to the seed. The nine perch/feeding station set-up, coupled with the anti-squirrel technology makes this feeder one of the most economical and convenient on the market! The three clear, seed tubes make it easy to monitor seed levels. Remember to clean your feeder once every two weeks with mild soap and water solution. One of our plastic bird feeders for hummingbirds, this bright, cheery feeder has a shatterproof bottle and will attract the tiny, delightful birds for hours of birdwatching enjoyment. 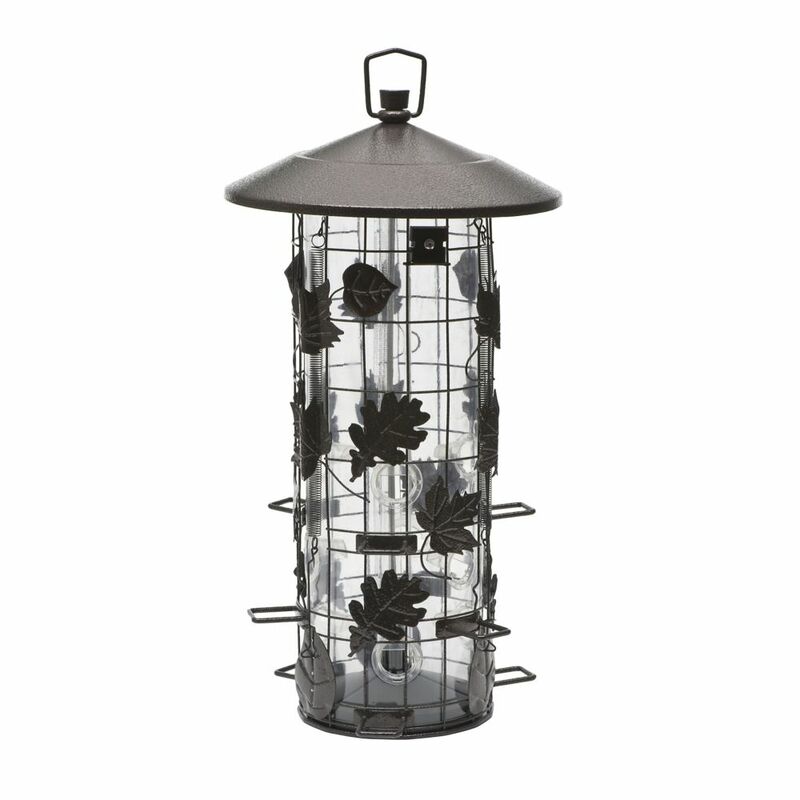 The Garden Song Clear Plastic Feeder features three feeding ports and holds 16 ounces of nectar for hummingbirds. Includes a packet of instant nectar mix that makes 32 oz. Remember to clean all of your feeders at least twice a week, more often in very warm climates or seasons. These clear plastic bird feeders may be cleaned with the Perky-Pet Cleaning Mop. Avec le distributeur de colibris en verre cuivre iligant Perky-Pet, vous obtenez des ditails ipoustouflants et un design fonctionnel dans un seul emballage pratique. La belle finition en cuivre brossi se combine avec la bouteille ` large ouverture pratique, les protecteurs intigris pour les abeilles, et quatre ports d'alimentation pour crier un aliment vraiment exceptionnel. With Perky-Pet 16 fl oz Red Hummingbird Nectar Concentrate, you can make 64 fl oz of hummingbird nectar. This vital energy source will keep hummingbirds coming back to your feeders and bring you hours of enjoyment. The nectar concentrate contains 100% sucrose and formulated to power the tiny flying dynamos we all love. The Perky-Pet Mason Jar Hummingbird Feeder's bright red bottle will let all of the hummingbirds know that your yard is the place to be for sweet nectar. The large 32 fl oz capacity glass bottle resembles vintage canning jars used in the 1800's and it will provide enough nectar so that your hummingbirds will never go hungry again! The wide mouth makes filling and cleaning mess free. The metal base and 5 flower feeding ports are easy to clean. Simply unscrew the bottle from the base and clean in warm soapy water - it's that easy! Squirrel-Be-Gone III Wild Bird Feeder The Perky-Pet Squirrel-Be-Gone Wild Bird Feeder III features 9 feeding ports, U-shaped perches, 3 separate seed tubes that allow for a variety of seed types and holds 8 lb of seed. The interior seed tower is surrounded by rustic metalwork. The feeding ports have sturdy metal perches that allow birds to feed comfortably-but, when the squirrels perch on them, their weight causes the entire metal casing to slip down, completely blocking the feeding ports and their access to the seed. The nine perch/feeding station set-up, coupled with the anti-squirrel technology makes this feeder one of the most economical and convenient on the market! The three clear, seed tubes make it easy to monitor seed levels. Remember to clean your feeder once every two weeks with mild soap and water solution. Squirrel-Be-Gone III Wild Bird Feeder is rated 3.3 out of 5 by 57. Rated 1 out of 5 by Daniel from SAVE YOUR MONEY - Very poor design & build. Save your money, the product is garbage. It will end up on the ground in pieces. The top hanging part is secured to the underside part as a pressure fit. not fastened in any way. It can't take the weight of the bird seed and a couple of squirrels. On the first day it separated and crashed to the ground. It was damaged in the fall. After repairing it I have tried reassembling it and hanging it again. Each time same result. Vert poor quality. Rated 4 out of 5 by Cheryl from So far it has kept the squirrels away.... So far it has kept the squirrels away. Rated 5 out of 5 by Kim from I love this bird feeder. It is pretty and keeps the squirrels out. Also, I love the fact you ca... I love this bird feeder. It is pretty and keeps the squirrels out. Also, I love the fact you can put three different types of seed in it.